Redbet Casino is a gaming operator licensed and regulated in Malta by the MGA (Malta Gaming Authority). Redbet Casino offers one of the largest collections of casino games and slots. This casino is divided in two sections: Casino Red (which is powered by Net Entertainment and Betsoft software), and Casino Blue (which is powered by NYX Interactive, Nextgen Gaming, Microgaming, Cryptologic software and others). On Casino Red you can choose from many games, slots and jackpots slots, including popular slots (like Jimi Hendrix, Guns N’ Roses, Drive: Multiplier Mayhem), video slots, table games (Baccarat, Blackjack, Roulette, Red Dog), Live Games, poker games, and other games (7 Gold Scratch, Ace, Bonus Keno). Casino Blue offers a lot of slots and jackpot slots, including popular slots (like The Wild Chase, Game of Thrones, 300 Shields, or Immortal Romance), video slots, multiplayer games (MP Avalon, MP Roulette), and other games (Baccarat, Craps, Tens or Better, plus many others). 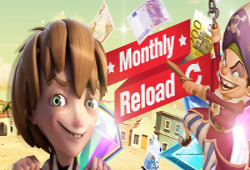 Redbet Casino is operated in 6 languages (English, German, Swedish, Norwegian, Finnish, and Polish), and for currencies, offers: EUR, SEK and NOK. For deposits and withdrawals can be used many methods of payment: Bank Transfer, Credit/Debit Cards, Skrill, Neteller, Przelewy24 . Another bonus of €100 you can get when you use the bonus code “100MAY”, after a deposit (100% bonus up to €100). To take this bonus, you must wager 25x the amount of the bonus, plus initial deposit. And the last bonus is for deposits made in weekends, after using the bonus code (MAYWTU1, MAYWTU2, MAYWTU3, MAYWTU4). Enter the bonus code, make a deposit, and you can get up to €75 (75% bonus up to €75). Overall Redbet Casino is a safe and trusted casino, with many bonuses and promotions, plenty of slots and jackpot slots, and a good support for customers.